Looking back over my diary pages I’ve noticed a heavy emphasis on all things meteorlogical and horticultural, but the truth is that much of our time is spent outdoors, mostly in the garden either (mostly) working on it or (less often) simply lying in the sun. I think moving here may have awakened a dormant gardening gene, previously put off by the cussedness of the English climate. So I won’t apologise for it; if you’re after an account of the Dolce Vita you’ll have to look elsewhere. We do have plans to start travelling in about a year’s time, at which point I’ll be able to comment on Venice, Florence, Rome or wherever the trains take us. So to the weather. The cold snap ended less than a month ago and the difference is overwhelming. Plants lay dormant for a month after the false start in early March but have now burst into leaf and flower, and the air is full of exotic and powerful scents from wistaria, oranges and other plants we have no names for. On one lovely Sunday afternoon at the end of April we drove to Rochetta Nervina, a little village about eight or so miles from here, nestled into the Maritime Alps up against the border with France. The village is incredibly pretty but surprisingly quiet, though this may have been due to everybody being at lunch in one or other of the two restaurants next to the road. Just the other side of the bridge in the middle background is where a couple of mountain streams meet. Here there are several small pools popular with bathers in summer. Even in late April there were people sunning themselves on the rocks, but once the holiday season arrives the coastal towns and their beaches become so insanely crowded that locals prefer the cold mountain streams, which are at least clean. There’s not really room to swim; it’s more a matter of having a quick dip, coming out, gasping for a while then laying on a rock to dry out and warm up before repeating the exercise. A bit like a sauna in reverse, if you see what I mean. After surveying Rochetta we drove to Dolceacqua for an ice cream. My calendar has the day labelled as Santa Caterina da Siena, which may be a feast day, but whether for this or another reason there was plenty going on both sides of the river. The place was covered with market stalls selling home-made craft goods and local produce, with particular emphasis on cactus plants of impressive variety. In the square the local school put on a performance by the children involving each of them dressing as an insect of some kind and enacting some kind of musical play, surrounded by doting parents and all of it completely unintelligible to foreigners. The whole town had that typically Italian holiday feel, with everyone chatting excitedly and having an all-round wholesome good time. The only downside on such days is actually getting in and parking; cars were having to circle time and again in the hope of finding a slot. And this was only April; I dread to think how it might be in August. Much of the work about the garden so far has been structural; levelling, laying out paths and pruning trees, for example. As yet we don’t have many plants growing that will produce anything edible, though the patio area is full of seed trays and small pots containing seedlings. Although we have about 2000 square metres (about half an acre) of land the actual area of vegetable beds is quite small as it’s a major effort to dig them out. Right now, strawberry plants are in the shops and it would be a shame not to have the fruit available on demand through the summer. My own experience of strawberries is limited but whenever I’ve grown them at ground level they get attacked by hordes of slugs or insects with sharp pincers. Although the former are rare in such a dry climate the latter have already massacred any seedlings left exposed on the ground, forcing me to put everything above ground on benches or tables until they grow strong enough to fend for themselves. When we moved here last year we found an untidy pile of plastic drainpipes left after the gutters and downpipes had been replaced by the previous owner. Rather than ship them to the tip I followed standard Italian practice and left them in case they may be needed, organized into a tidier pile (though still, it has to be admitted, not a pretty sight). 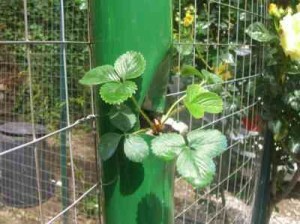 The idea came to me of using some of these to form vertical strawberry growing containers, thereby killing at least three birds with one stone. To start with the pile is now a little smaller; secondly the strawberries will be out of the reach of ground-based pests, and thirdly we improve the aesthetics of one of the fenced areas by attaching each pipe to a fencepost. Each pipe was cut to the height of the fence, then after making a number of saw cuts I heated up the plastic with a blowtorch to form pockets, painted the whole thing a tasteful green, attached it to the fencepost, filled the pipe with soil and planted strawberries in the pockets. The big unknown is whether the plants will thrive in the limited soil volume, but we’ve gone for a variety we were told is suitable for hanging baskets, which also don’t have a great deal of space, so I’m hopeful. At least water retention should be improved by the enclosing plastic pipe. 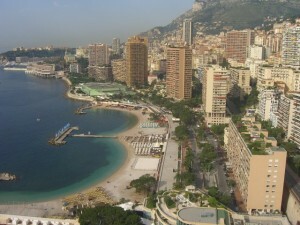 At the end of April we took our guests to Monaco for the day. With the Grand Prix just four weeks away the harbour area was transformed; instead of the usual cafes there were the pits, and lining the roads grandstands were being assembled like huge Meccano kits (if you’re under 40 you probably never heard of it and don’t know what you missed – the best toy constructor kit ever). Apart from that modestly interesting difference the town was the usual strange hybrid of close-up pretty backed by high-rise ugly suburbia. We stopped first at the Carrefour, to park and to stock up on the essentials unavailable in Italy, and discovered that as the following day was May Day everybody else was in there frantically buying up the place. As if a single day’s holiday requires a major shopping trip. Strange people, the French. After that we walked our usual route past the palace and through the gardens to the harbour. With all the cafes missing from the Grand Prix pit area I started to worry about getting lunch, but there was plenty of room at a comfortable pavement cafe down by the harbourside. I think we’ll give Monaco a miss for the rest of May; if there’s really anything worth seeing it’ll be far too busy to get near it. We’d been getting reports of a sandy beach at Calendre, just outside Ventimiglia on the way towards France. So when we had to drop our guests at the station early in the morning to catch their train to Paris it seemed an ideal opportunity to find this beach. 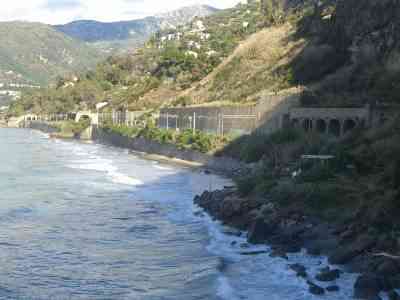 Sand is something of a rarity on the Riviera; most beaches are shingle at best; rocks if they’re less favoured. We found the path to the beach after driving back and forth along the road a couple of times. 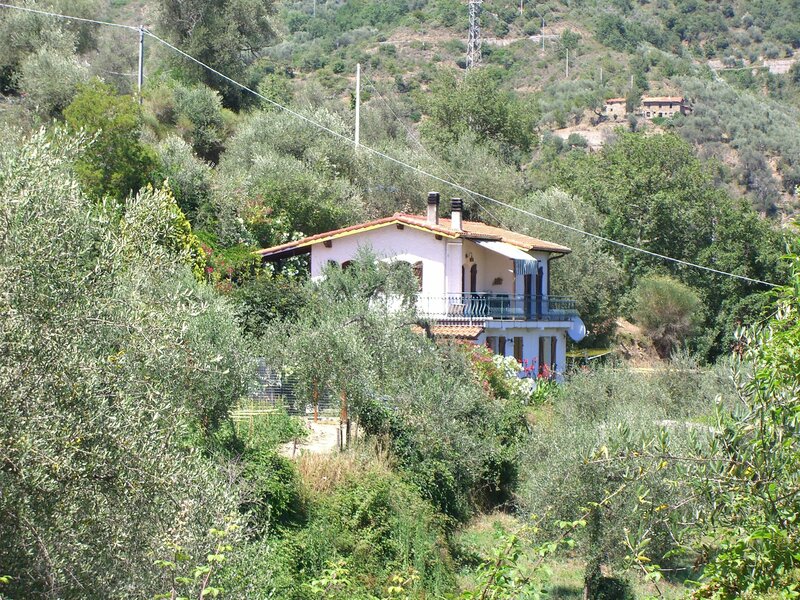 It’s about a fifteen-minute walk from the edge of Ventimiglia proper or ten minutes down a steepish path from the road that goes past the old town perched on a hill. It’s not actually much of a beach, as you can see from the photo; just a narrow strip of sand under a wall behind which is the railway. But if sand is what you want your choices are limited. At least there’s a cafe – with the usual sun-beds for hire – and a fresh-water shower, but at the end of the day there’s that ten-minute walk up the path to the road, carrying all your beach stuff. The picture is a little unfair since it was early in the morning after a night of rainstorms; most of the day the sun is full on and I hear it’s more popular than you might think from this view. Maybe it’s measure of how desperate people are for sand for the kids to play on. The general problem with Riviera beaches – both French and Italian – is they’re located in one of the most densely-populated parts of Europe. Most are shingle and uncomfortable for getting in and out of the water. Some are rocky; fine for snorkelling if you’re experienced but potentially dangerous with slippery surfaces, spiny sea urchins, underwater overhangs and unexpected currents. Not places to let the kids loose. And they’re either difficult to reach, like this one, or impossible to find a parking space near, or private with densely packed rows of sunbeds and umbrellas allocated to hotel guests or rented by the day at a cost of maybe five euros a person. There’s no such thing as an unspoilt, wide sandy beach with free access and a big car park. Not for over a hundred miles in each direction. 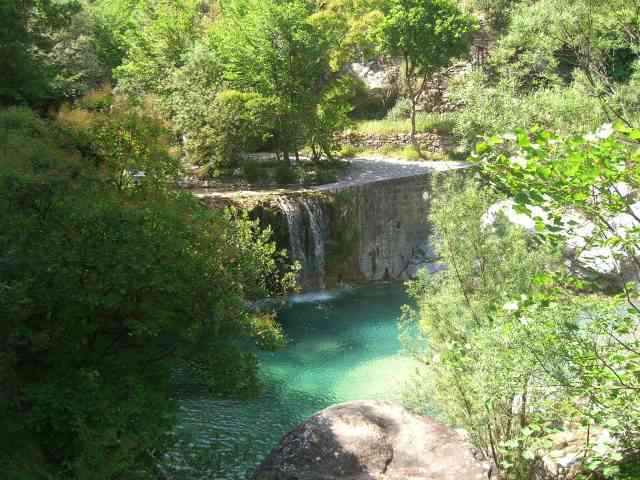 Hence the attraction of the rock pools at Rochetta Nervina.